Not yet officially on the market, the new Stratos is already on the international podiums. Since 2008, the range of "Stratos" ski mountaineering boots comprising the most lightweight, high performance and avant-garde products on the alpine ski market, has come to represent La Sportiva’s state of the art, innovative technology applied to footwear for alpine skiing: this is where the more advanced mechanisms and solutions originate, often verging on the experimental, which are subsequently shaped, when considered sufficiently reliable and efficient, this is true also for the more commercial boots designed for a less extreme use. The origin of successful products such as Syborg, Spitfire (now at the second version the 2.0, like the other boots in the two buckle collection) and Spectre, lies right here: in the constant research and race to anticipate the times in collaboration with the best athletes in the world of ski mountaineering, those incremental innovations capable of making a difference firstly, in a race and subsequently, when worn by less performance-oriented consumers, attentive to the quality of the products they wear. 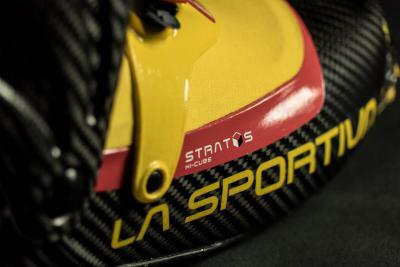 In the beginning there was Stratos, then came Stratos Evo, then, Stratos Cube and today, about six years after the beginning of the project, it is the turn of Stratos Hi-Cube, the "enhanced" version of Cube, former winner, in its prototype version, of the 2015 World Cup with Damiano Lenzi. Even lighter in weight (the shell will weigh 450 grams), it has a sturdy structure but is minimalist in design, the boot has bulletproof reinforcement side ribs and a uses the "Heel Spur-Construction", a completely new design of the heel to give even more strength to the product and allow maximum compatibility with crampons on the market. So while Damiano Lenzi himself and calibre-athletes Peter Lanfranchi and William Bon Mardion will already be wearing the new model this season, the product will arrive in stores for winter 2016/17 enabling the La Sportiva to further develop and refine the boot during the current winter season thanks to feedback from the best athletes in the world. So if Stratos Cube had already been spoken about, now it's the turn of Hyper-Cube, the evolution to the nth degree. Follow all the race results of the boot on the Lasportiva.com website and on the company's official Facebook page.